With "kitchen" in its name, it’s no surprise that the cocktails at this Hampden mainstay lean a little on the culinary-side. Woodberry Kitchen is infusing bourbon with granola; stirring in pork-fat maple; thickening things with yogurt whey; and spicing things up with fish-pepper-infused tequila. 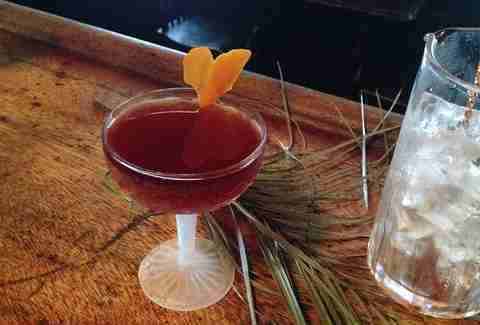 "The Appalachian" is especially intriguing, with its triple-smoke apples, bourbon barrel sorghum, oven ash (! ), Few rye, and 1757 brandy. 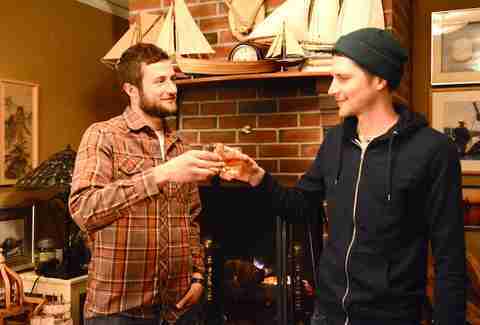 WK is also a good place for local mead- and cider-junkies. Pair just about any of the above elixirs with fresh Chesapeake oysters or a flatbread for a nice little evening at the king of coziness. There’s something spellbinding about the way pickle brine and whiskey go together. It’s as right as Homer and Marge. 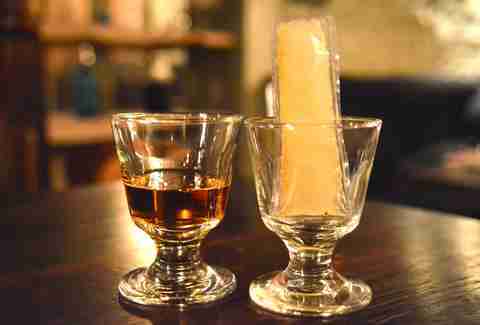 Fork & Wrench elevates the classic combo from a pickleback to a "picklepop," served alongside the bartender’s whiskey whim. Try one at the first floor bar punctuated by rustic tools. It’s the heart of the three-floor restaurant constructed from two adjoining row homes. That’s where you’ll find the Thursday night bartender competition, requiring two mixologists to face off using a secret ingredient selected by General Manager Ingrid French. Patrons vote on the winner -- and rumor has it, the cast of Veep recently participated. We also dig that "Love" is on the cocktail list; that’s when you fork over (!) $8 to buy the kitchen crew a Mason jar of PBR. It feels like you’re stepping onto a ship when you cross the threshold of this Scotch bar that could very well serve as a museum of the single-malt spirit. Consult a laminated Excel spreadsheet of 130 Scotches, color-coded by region, to pick your pour. If regions don’t do it for you, look for red text symbolizing that you’d like to get spanked with peat. The nautically appointed bar looks like a visit to an eclectic uncle’s house, with its crackling fireplace and worn couches. Just don’t expect any mood-lighting in the cozy back room, nor a bartender who fawns over customers. Drinking is serious business here; so for the love of god (or Ron Burgundy), don’t request anything "on the rocks." Pro-tip: Lure owner Alicia Horn into telling you stories -- she’s been at this for decades. One of Baltimore’s cocktail authorities sets up shop at B&O American Brasserie inside The Hotel Monaco Baltimore (stay here, by the way). 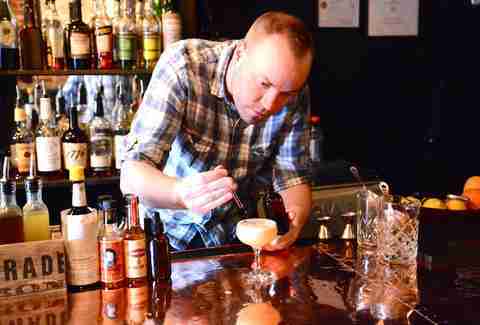 Brendan Dorr is the bar’s lead bartender and founder of the Baltimore Bartenders’ Guild. Watching him shake and stir is kind of like watching an Olympic athlete compete in a sport you can only hope to understand (trampoline?). He’s makes school bus-yellow drinks from golden beet juice, whips up a handsome stout flip, and serves a memorable Mason jar filled with Line State punch for two. He’s even dreamed up cocktails to pair with dishes on the dinner menu. Don’t leave without trying a B&O Old Fashioned or the pit beef sliders. Bad Decisions is known for two things: its collection of 900 kinds of liquor, and being a bastion of bacon. Well, three things, if you count making poor choices like talking the bartenders ear off about what Baltimoreans think of "Serial." Settle in and see if you can snag time with the drink list. There’s only one, and it amounts to hand-scribbled recipes in a graph paper notebook. Order a Bald Cucumber, or just tell the bartender any drink you’ve ever enjoyed and he’ll make it. 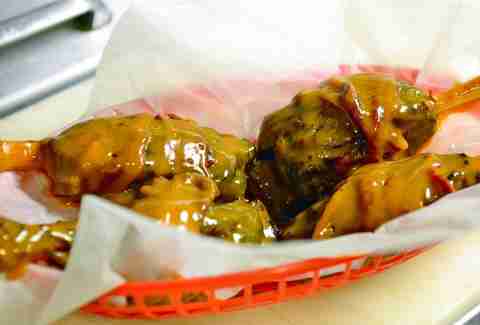 Then nosh on these bacon-wrapped pork wings -- smoked- and deep-fried pork shanks wrapped with the good stuff and covered in BBQ sauce. Don’t leave without taking pause to appreciate the Four Seasons-level of service at a four-star dive bar. 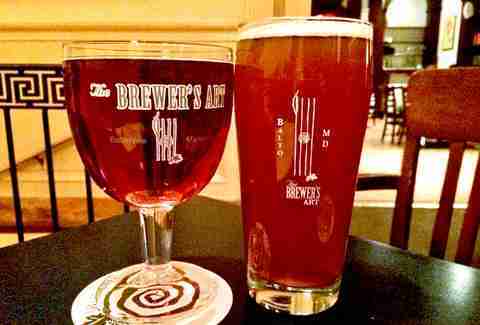 To fully experience Brewer’s Art, bypass the buzzy upstairs bar and fireplace (and a quaint dining room) and head to a catacomb of strangers rubbing up against each other. 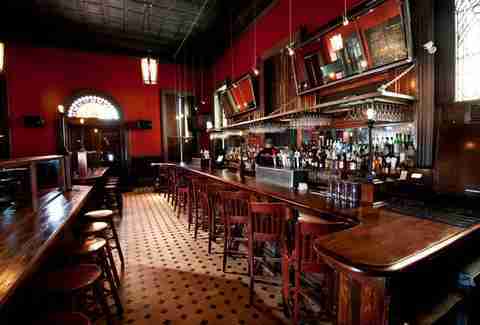 It’s otherworldly on this the lower level -- all fueled by eight top-notch house-brewed beers that clock in at $6 a pint. The fact that the massive edifice dates back to 1903 (when it was a baller’s private home) means they have space to brew right on site. There are six house-cocktails, too, but why bother when the beers are as tasty as Resurrection, an Abbey-style brown ale, or Wuyi ale, brewed with Lapsang souchong tea. There’s no bad seat here, thanks to a handsome copper bar and a lodge-like back room. Plop down with a menu organized musically from "Easy Listening" libations to "Outlaw Country" craziness. A favorite is owner Doug Atwell’s "Penicillin," a frothy egg white potion made from blended Scotch, ginger syrup, lemon, and walnut bitters. Then there’s Baltimore’s somewhat signature cocktail: The Diamondback, named for the storied-but-extinct Diamondback Lounge at the Lord Baltimore Hotel. As you explore, keep your eyes peeled for Prohibition-era medical prescriptions for the whiskey lining the walls. Pro tip: if you know where you’re headed next, alert the bar team and they may send you with a "Boomerang" -- a cylinder of shots affixed with a love note from one bartender to another. If Rose’s Luxury did brunch it would look a lot like Maggie’s Farm. The pink-hued nod to Bob Dylan, known for its creative drinks and donuts, has the same one-two punch of quirk and charm. Whether you visit for cocktails and dinner or for brunch, you’re getting the liquid pièce de résistance: the Mason jar Boh-Jito. 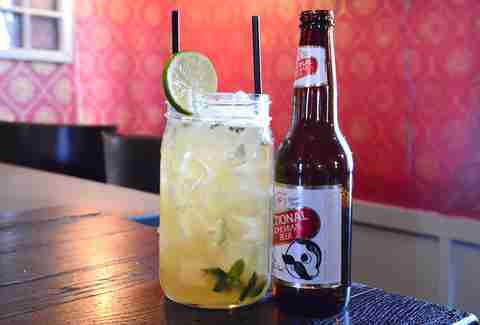 Hush your squeamish friend and tear into 32oz of bourbon, Natty Boh, and the makings of a mojito. On a more serious note, there’s the Hall Springs, featuring MF’s house-made chai bourbon, or the Smoke & Mirrors -- a cocktail so good that patrons rioted when it exited the menu (never again!). Just when you think it can’t get better, you find out Maggie's Farm's slogan is #LikeABoss. 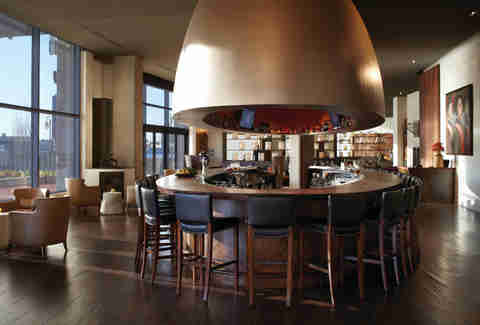 Gluttons for all-things-trendy should swing by Wit & Wisdom, tucked into the Four Seasons Hotel Baltimore. 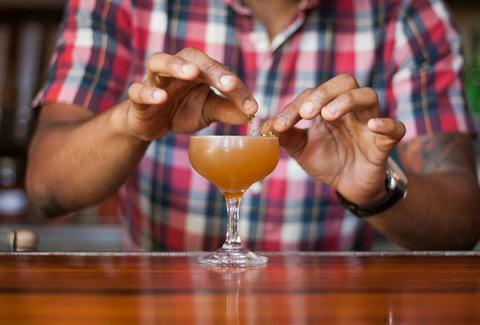 Lead bartender Aaron Joseph has his finger on what’s now and what’s next, from barrel-aging and bottled cocktails to taking a culinary approach to drink-building. Aaron’s not afraid to vouch for Cognac, hence his seasonal Winter's Decadence cocktail with Hardy’s VS Cognac, oolong breakfast tea, spiced apple, almond syrup, and lime. 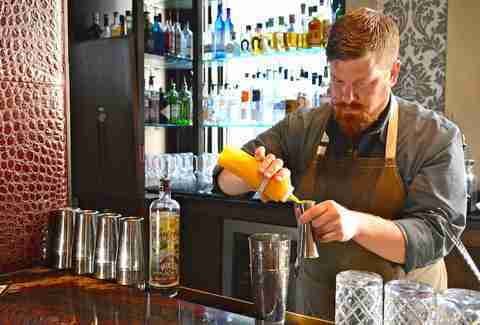 His next projects include bringing back the milk punch and an evening of rum-and-cigar pairings in April. Here’s hoping they’re Cuban. Take all of your convictions about what constitutes a "hotel bar" and throw them out the window. A few steps into The Owl Bar, located inside the historic Belvedere, and you’ll find an eclectic bar decked with an owl insignia, where Journey is played and pizza & fried pickles are cranked out. 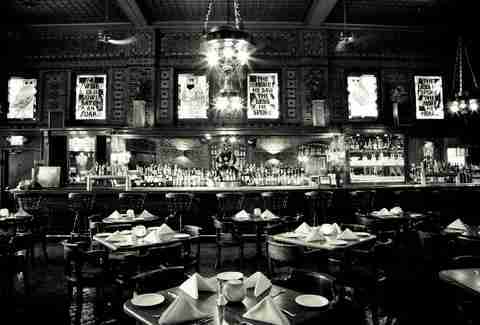 They’ve been a reliable nightlife destination for drinks since opening in 1903. This includes Prohibition, when the owl’s blinking eyes signified a shipment of booze had made it and the feds were nowhere in sight. The bar's 18 draughts are interesting, and the cocktails are split between old-school and new-school (and top out at $12). Before bouncing, head up to the hotel’s 13th Floor for a drink with a view. You won’t find a cocktail menu at this Prohibition-era drinking den named for co-owner Lane Harlan’s Grandfather. You also won’t find a sign marking the entrance, making the bar an accidental speakeasy. Once you discover it, settle onto a Victorian couch and order the $8 cocktail du jour -- it’s been different every single day since the bar opened in 2013 (yeah, that’s hundreds of drinks). Alternatively, you can order a classic cocktail or tell the bartender how you’re feeling and he or she will whip something up just for you. There’s something about dim lighting, old tango music, and the fact that you can opt for a $2.50 beer that makes this place extra special. If you can stop carrying on about the hipsters, you’ll find a notable beer & cocktail gastropub near the Natty Boh Tower. It’s nicknamed OLAR, not to be confused with OMAR from The Wire. 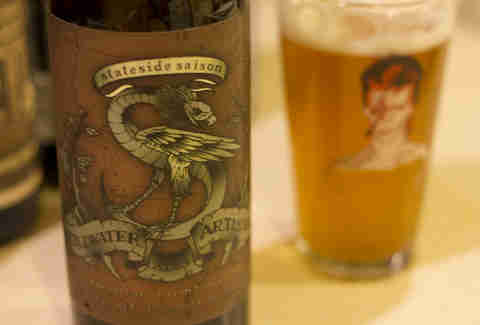 Beer-wise, you’re drinking Stillwater Artisanal drafts from owner Brian Strumke. He’s been labeled everything from a "gypsy brewer" to a "vagabond" because of his habit of utilizing others’ equipment instead of setting up a brewery of his own. It’s working, because the 18 Stillwater options (and counting!) are tasty. OLAR's cocktails promise to eschew fancy bitters and syrups in favor of booze thoughtfully layered on booze. We dig the barrel-aged options priced at $11 or less, and creative shot-and-beer combos like a can of Classique paired with a shot of Fernet-Branca. 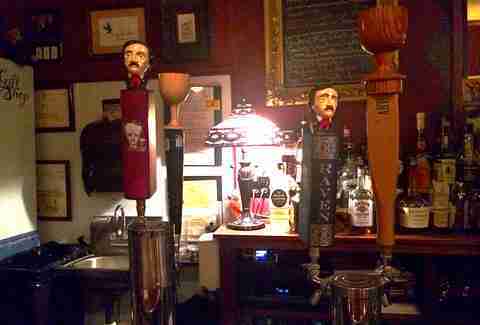 This bar embraces Edgar Allen Poe to the extreme (but not a creepy extreme like The Following). For starters, there are about a dozen Poe-themed cocktails like "The Raven," which gets its purple color from cranberry juice and four kinds of berry vodka. Perhaps they should call it the "Poe-Island Iced Tea," since it’s served in a full pint glass. Or, opt for a draft of Tell Tale Heart IPA or The Raven Special Lager, both from local brewery Baltimore-Washington Beer Works. Bar Manager Donnie Meyd says the goal was for the space to feel like a grandmother’s living room, and boy did they succeed. Pass the crochet needles, please. Oh, and an order of their legendary duck fat fries. Max’s has been a bastion of beer for 28 years, bringing pints upon pints to thirsty Baltimoreans. If 102 different drafts (including five cask beers) don’t impress you, surely the 2,000 bottles will. 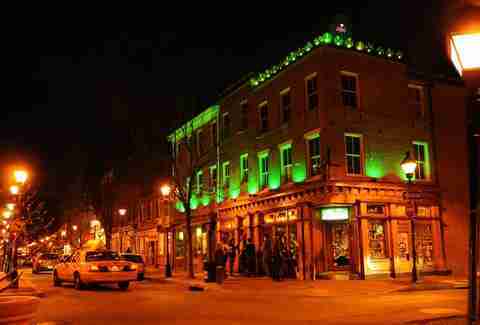 If it wasn’t so expansive -- there are three separate bars with cool names like "Mobtown Lounge" and "Notre Passion" -- it might remind you of DC’s beloved ChurchKey. Soak up all that beer with two epic creations: the tater bowl, which is a hot mess of pulled pork & cheese atop steaming hot tots, or Max’s "Suds Sponge," which is even more over-the-top. General Manager Casey Hard says Max’s is also known for being the king of beer debuts, as one typically takes place once a week, keeping the bar on the cutting edge of brews. You’re coming to this old bank building that dates back to the 1800s for two things: the curated list of 40 craft beers on draft (plus bottles) and the Smoke Burger. Picture a stack of smoked Gouda, Gruyère, Applewood-smoked bacon, caramelized onions, and chipotle aioli atop a patty of local beef on a brioche bun. Alewife’s motto is simple: "We don’t serve any sh*t." That’s Bar Manager Leila Ghandi’s philosophy, and she’s referring to not serving certain popular beverages you may see advertised during sporting events. Alewife's beer list is updated online, and favors breweries like Terrapin, Victory, Smuttynose, and Yards.